Ergonomic & Fashion Design : Soft Silicon Ear Hook, Super High Quality Material, Highly Adjustable Microphone with Build-In Bluetooth v4.1 +EDR CSR8615 & CVC 6.0 Noise Cancelling Tech & HD Stereo Sound. This Little Ultra LightWeight Headset Will Bring You An Amazing Experience. Easy 2 Use : Auto Into Pairing Mode When The Earpiece Turned On. Once Your Earpiece Remenber Your Devieces, It Will Auto Reconnect! With The Voice Prompt ( SIRI Supprted ) And Friendly Button Design, It Can Help You Pick Up Phone Call Or Control Your Devices Within 33Ft From Your Phone(Does Not Support Voice Command). Charging & Battery : Micro UBS Port Make Charing Can’t Be Easier! Charge Your Headset With Micro USB Cable Via PowerBank, Adapter Even Laptop. It Only Need To Charger One And Half Hour To 2 Hours, Then You Can Use It For Music ( 7-8 Hrs ) or Calling ( 9 Hrs ), And Don’t Worry About Forget Turning Off Your Headset, Because It Will Standby More Then 7 Days For You! iPhone Will Display Battery State On The Top Right Side Of Your Screen. Your new headset has enough power for paring and making a few calls before charging is needed, though you may charge at any time. 1. Make sure the headset is powered off and in range with your device. 2. Wearing your headset, switch it ON and it will enter pairing mode directly, and the headset indicator flash red and blue. 3. Active Bluetooth on your device and set it to search for new devices. 5. Once successfully paired, the headset LED indicator light stops flashing. We provide 30 days full refund for NO REASON, 1 year warranty and free lifetime technical service! 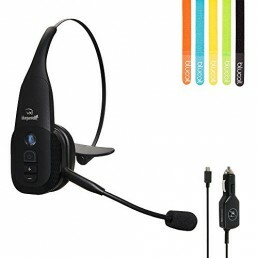 Comatibility : Multipoint Tech Allow Headset Pairing To 2 Devices Simutaneously! And Headset Also Has Wide Compatibility To Pairing With All Bluetooth Functional Android/iOS/Windows Smart Phones & Tablets On The Market! Guess What Will You Get : Durable ANTIANT Bluetooth Headset x1, Carrier Bag x1, Mini Micro USB Charge Cable x1, Eartip x3(S,M,L), Instruction Manual x1, And 30 Days No Reason To Return, Worry-Free 12-Month Guarantee Period And Friendly Customer Service.